50th Annual Country Music Association Awards Nominations – Preview, Live Blog, List & Discussion Post! It’s time for us to learn the nominations for the 50th Annual Country Music Association Awards! The CMA Awards are generally seen as the more Nashville-based, more serious of the two major country industry awards functions, and this year, co-hosts (for the 9th consecutive year!) Brad Paisley and Carrie Underwood are promising (via a recent Southern Living cover story, linked here) a ritzy, packed show honoring the CMA’s rich past as much as it celebrates current country’s present during the Wednesday, 11/2 live telecast. The awards being doled out are largely an excuse to put on such a show, but it is the awards show nominations that come first, so it’s the award show nominations that we cover first. What should you expect from the nominations? In an effort to do away with expensive campaigns (a la Taylor Swift and Blake Shelton) in which CMA voters got all sorts of swag to sway their votes, this year’s CMA voting process prohibited For Your Consideration mailings (physical and digital) to voters, instead putting a central nominees showcase in which the 15-20 finalists in each category were given the opportunity to put up a digital flyer touting statistics that help make their case to be nominated. The same rule will apply in the next round of voting, which will decide the winners. It’s an acknowledgment of, well, imperfections in the voting process as it translates to outcomes, bu will it be enough of a fix? After all, this didn’t stop artist teams from campaigning outside of the showcase. Dierks Bentley has had one of the season’s most aggressive campaigns as his team seeks to convert his momentum into country A-list status, including this ‘Behind ‘Black’ video diary featuring commentary from contributors and stakeholders in his current Black album and “Somewhere On A Beach” tour, and he has made it known that he is especially interested in the Album and Entertainer Of The Year categories. His team also carted out industry media to two of his Megaticket summer shows (on 5/23 and 8/13, the latter right before the 2nd round of CMA voting began). Meanwhile, Blake Shelton played surprise small venue gig after surprise small venue gig (but not at the Opry where he committed to playing 10x a year but hasn’t played in a year) both during CMA Fest and just ahead of the 2nd round of CMA voting, while also leveraging his celebrity into a Billboard cover story, several TV appearances and performances, and a $0.99 Google Play discount for his album that sent it shooting up to #1 on the Billboard Country Albums chart that was published on the day that the 2nd round of CMA voting began. Blake was shut out of the ACM nominations this year entirely, and appears very interested in re-entering the mix at the CMAs, where he’s traditionally fared better. The timing of his latest tweet dust-up may hurt him. While far less aggressive, Carrie Underwood was one of several artists who scheduled the celebratory industry parties marking #1 airplay hits around the CMA 2nd round voting window, and her joint #1 party for “Heartbeat” and “Church Bells,” her 23rd and 24th career #1 hits, respectively, featured acoustic performances with the songwriters of those two songs plus her new single “Dirty Laundry,” as well as some pointed comments by Sony Nashville Chairman/CEO Randy Goodman about what she means to the country genre. 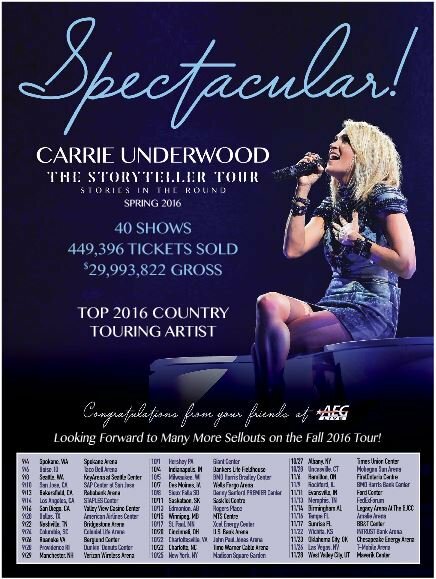 Carrie’s tour promoter AEG Live also ran an ad in the 8/15 editions of Country Aircheck Weekly and Billboard Country Update to note that Carrie’s Storyteller: Stories In The Round tour is Billboard’s top-grossing country tour of 2016 through the mid-year mark. Looming even larger over the past four years or so than awards show campaigns has been the voting bloc combination of William Morris Endeavor talent agency (which has been happy to crow about its weight in post-awards show ads like the one on page 3 and this one on page 5) and tour promoter Live Nation. This year, that combination seems likely to lift Dierks Bentley, continue to support last year’s CMA breakout Chris Stapleton , superstar Luke Bryan and its lone female headliner Miranda Lambert, and then there’s the question of whether it will have “graduated” the likes of Jason Aldean and Blake Shelton in favor of cultivating a new generation of headliners, including Bentley and Thomas Rhett. Nominations will be announced by the aforementioned Dierks Bentley, Cam (whose “Burning House” stands a strong chance at a Song of the Year nomination) and Keith Urban, who has played a couple of Grammy-targeted acoustic showcases (one of them in Nashville during the 2nd round of CMA voting) of his heavily electronic album Ripcord, leveraging his musical chops to showcase his thought process behind the sound of the album. Don’t be surprised to see both Dierks and Keith in the Album of the Year category. Other names you should expect to see: Eric Church, who is a shoo-in for nominations in the Album, Single and Song Of The Year categories, and Maren Morris, the pop/soul combining Texas singer-songwriter who has captured critical and industry acclaim alike with her adventurous debut album Hero. In fact, look for one of the storylines out of the nominations to be the emergency of country’s next generation of women, as Maren Morris, Cam and Kelsea Ballerini all look to be nominated in multiple categories. And for a fun insurgency prospect, the supremely talented and outspoken singer/songwriter Sturgill Simpson is among the top-20 contenders for Male Vocalist Of The Year, Album Of The Year (for the deservedly acclaimed A Sailor’s Guide To Earth)and New Artist Of The Year. He exists far outside of the mainstream commercial country sphere, and has made it clear that even if he is nominated for a CMA, he will not attend, because he has a sold-out show in Des Moines, Iowa that night. So these nominations have tended towards the sadly predictable over the past few years (with the happy exception of last year’s Chris Stapleton bonanza), but here’s hoping that some pleasant and overdue surprises emerge. Onward! We’ll be updating this post with the nominations and some insta-analysis. Join us with your comments, won’t you? Insta-reaction: Well, I guess it only took the overwhelming undeniability of the Storyteller: Stories In The Round tour to finally snag Carrie her first nomination in this category! Three of the five nominees in this category are repped by WME (Garth, Luke, and Chris Stapleton), two by CAA (Carrie and Keith). Three of the five nominees tour with Live Nation (Luke, Chris Stapleton and Keith Urban), 1 with AEG Live (Carrie) and Garth’s tour is promoted by Bob Doyle & Associates. Label-wise, three out of the five nominees (Luke, Chris Stapleton and Keith) are from the UMG Nashville family (two from Capitol Nashville – Luke and Keith) and 1 from Sony Nashville (Carrie). Garth is currently not affiliated with a label, as his deal with Sony Nashville ended. Chris Stapleton’s breakout means he sold far and away the most music during the eligibility period, and his ambassadorship for country music in the past year on music’s all-genre stages (with performances on Saturday Night Live, for example), is undeniable. On the other hand, Carrie Underwood is bigger live, has fared better at radio and has a career of ambassadorship for country music that is unrivaled by her peers. She is also long overdue to win here. Luke Bryan is the two-time reigning winner in this category, but one senses that voters might look elsewhere this year. It may be foolhardy to count out Garth, but it’s difficult to make a case for him when he isn’t riding new music. So this category looks to be a race between the CMA-fueled breakout who was bigger than anybody in country over the past year (Stapleton) and the career of country’s most impactful current female who is finally being recognized as having come into her own (Underwood). Stapleton will have the WME/LN combination in his corner, as well as the biggest label in UMG Nashville (though Luke Bryan also has this constellation of backers). Insta-reaction: This is a category that CAA typically dominates, and sure enough, four out of the five nominees are CAA-repped. But the one who isn’t, the one who, if we’re being honest, is taking up a spot that could have gone to a female artist who actually released a full album during the eligibility period (like Cam, Brandy Clark or Jennifer Nettles), is six-time reigning trophy holder Miranda Lambert. She released her much-acclaimed new single “Vice” after the eligibility period ended, and given the WME/LN stranglehold on voting at these shows, it may be naive to count her out, especially when she won the ACM in this category despite basically being inactive. Kelsea Ballerini is working her way into the conversation with radio hits (she is about to score her 3rd airplay #1, which would make her the first solo female to debut with three #1 hits in decades if one doesn’t count Carrie’s Radio & Records #1 for “Don’t Forget To Remember Me”), but her overall profile pales in comparison to Carrie’s. Maren Morris is the most nominated female this year, but if she pulls off a win, it’s most likely to be in the New Artist category. Based on actual accomplishment, Carrie would appear to be the runaway favorite here, but we’ll see. Sony has three of the category’s five nominees (Carrie, Maren and Miranda), UMG Nashville one (Kacey) and Black River Entertainment one (Kelsea). Insta-reaction: Three out of the five nominees is repped by WME (Dierks, Eric and Chris Stapleton) while 2 are CAA-repped (Tim & Keith). Two out of the five aren’t currently touring, but the three who are are on tours promoted by Live Nation. Four out of the five nominees are UMG Nashville signed – only Tim McGraw is not (he’s signed with Big Machine). As far as the likely winner, Eric Church seems likeliest to get his due in the Album category, which likely makes this a race between last year’s winner and breakout Chris Stapleton and the momentum-building Dierks Bentley. I would imagine Stapleton remains the heavy favorite here, as I can’t see why CMA voters wouldn’t want to reinforce their decision from last year. It’s noteworthy that Jason Aldean and five-time Male Vocalist winner Blake Shelton are absent here and, indeed, from the nominations entirely. Aldean has always fared better at the ACMs than the CMAs, but Blake has generally fared better at the CMAs, and he pushed hard to return to the nominations this year after being shut out at the ACMs. As noted above, I think it’s a sign that both have been “graduated” by the blocs that supported them at these shows. Insta-reaction: Two return nominees here in Kelsea and Cole, which means they will no longer be eligible. Sony has two nominees (Maren and Old Dominion), Warner one (Cole), UMG Nashville one (Brothers Osborne) and Black River Entertainment one (Kelsea). Two of the nominees are CAA-repped (Kelsea and Maren) and two WME-repped (Brothers Osborne and Cole Swindell). The surprises here are more in who doesn’t appear: Brandy Clark and Sam Hunt could have both been return nominees, but Sam Hunt wasn’t among the 20 finalists (which could preserve his eligibility for next year) and Brandy, despite industry love that drove her to a New Artist nomination two years ago, was shut out entirely. Also not appearing: Cam, who scored multiple nominations on the strength of “Burning House” and has a critically-acclaimed debut album that has sold well for a new artist and Jon Pardi, who scored a lot of positive press this summer for succeeding at radio and in the market as a new artist performing actual country music. Maren Morris has the most multi-category support here, and would appear to be the favorite for that reason. Insta-reaction: Still difficult to see anybody unseating FGL here. Interestingly, despite the hugeness of their single “H.O.L.Y.,” this is FGL’s only nomination. Insta-reaction: This is the one category where CAA (which reps 3 of the nominees, Lady Antebellum, Little Big Town and Zac Brown Band) has gone up against WME in the past few years and won, but that’s largely because there’s the only WME-repped nominee, Rascal Flatts, is no longer a viable awards contender. Four-time reigning trophy holders Little Big Town have had a quiet year, running a victory lap for last year’s Song and Single Of The Year winner “Girl Crush,” watching the follow-up single “Pain Killer” miss the t40 and then releasing a pop-dance album produced by Pharrell Williams that didn’t make much of a mark commercially or critically. So it would make sense for someone else to win this year. But whom? Zac Brown Band is far and away the most commercially successful act here currently — it tours arenas and stadiums, has had a #1 single and another t20 single during the eligibility period and a solid-selling album, though it was released in the previous eligibility period. But they have been vocal about not being part of CMA/ACM-politicking. Still, they would seem to have a better shot than Rascal Flatts, having made the t15 for the Entertainer Of The Year race along with Little Big Town, while Flatts didn’t. I’m going to go out on a limb and guess that Old Dominion, which is comprised of a number of well-liked songwriters who have written hits for a variety of fellow artists, could pull an upset here this year, despite being new as a group. Insta-reaction: Three Capitol Nashville nominees here (Dierks, Eric and Keith) and two Sony Nashville nominees (Maren and Carrie). Two WME-repped nominees (Dierks and Eric) and three CAA. Eric Church’s CMA-day surprise release album got overshadowed in a big way by Chris Stapleton’s breakout last year, but odds are that his critically-acclaimed release will have its day this year, in this category. Insta-reaction: These are probably the five most buzzed-about country singles this year. If “Humble & Kind” wins, that would make Lori McKenna the first back-to-back Song Of The Year winner since Vince Gill won three years running from 1991-1993. She would also be the first woman to win the CMA for Song Of The Year in back-to-back years (hat tip to @mwaga2 for making me double-check this). McKenna is a beloved enough songwriter in the community that I can see her pulling off the win. Might be worth watching out for “My Church” and “Record Year,” though, given the multi-category support that Maren Morris and Eric Church command. Insta-reaction: Same as Song Of The Year, just swap out “Burning House” for “Nobody To Blame.” “Die A Happy Man” is the biggest hit here and may be a frontrunner for that reason alone. But Maren Morris’s breakout hit “My Church” seems like a strong contender as well. Label-wise, you have two Big Machine Label Group singles (which could split that label’s vote), 1 Sony single and 2 UMG Nashville singles. That could open the door further for “My Church,” unless the WME/LN bloc steps up to assert a win for Thomas Rhett. Insta-reaction: Four out of the five nominees involve UMG Nashville acts, with three of those four involving Capitol Nashville acts. Realistically, this would appear to be a race between the three that have actually been radio singles and already been hits (“The Fighter” is not yet a U.S. single): “Home Alone Tonight,” “Different For Girls,” and “Think Of You,” with the latter two representing the more respectable choices as songs. Controversy about its lyrics notwithstanding, “Different For Girls” is the most current hit of the nominees and would give Dierks Bentley a win, so I think it’s the frontrunner. Interestingly, co-host Brad Paisley’s collaboration with Demi Lovato, “Without A Fight,” didn’t make the nominations, a testament to how much the voting blocs have moved on from him. He has the assurances of a strong platform at the show regardless as co-host, anyway. Insta-reaction: “Record Year” won the ACM for Video Of The Year, which may be a testament to the amount of support that song has (which could be key for the Song/Single categories, too). But “Fire Away” and “Humble & Kind” are powerful, message-based videos that stirred people, and “Burning House” has a well-regarded video, as well. The winner here is likely to be a bellwether for the Single/Song categories as well. Insta-reaction: Eight-time reigning winner Mac McAnally is absent from this category due to a new eligibility rule that required all nominees to have credits on at least three t10 singles or albums during the eligibility period. Per a McAnally spokesman in Billboard Country Update, McAnally did not qualify under that rule. Jerry Douglas and Dann Huff are three and two-time winners in this category, respectively. Here’s hoping that Paul Franklin finally gets his due. This is his 24th nomination in this category, and he hasn’t won yet! Overall thoughts: Well, due to a combination of inactivity among a couple CMA darlings and what appears to be moving on from a couple of male heavyweights, this year’s CMA nominations have a bit of a different look than usual. It’s difficult not to be very happy for Carrie Underwood, whose CMA/ACM recognition has matched neither her accomplishments nor her Grammy haul, and who finally gets rewarded with the Entertainer Of The Year nomination she had earned many times over. Maren Morris’s nominations haul suggest that a new CMA darling has arrived. Eric Church looks poised to have the moment that was overshadowed a year ago. Dierks Bentley’s forward momentum continues and the Chris Stapleton story is rightfully still being celebrated a year later. But my main takeaway is that the CMAs have an opportunity this year to make a strong statement for women in categories often dominated by males: Lori McKenna has a strong chance to take home Song Of The Year as a solo writer (fellow nominee Cam would also represent a win for women were her song “Burning House” to win), Maren Morris is likely the frontrunner for New Artist Of The Year (with another female, Kelsea Ballerini, well-positioned to make her own push), and Carrie Underwood, the country genre’s most impactful female of the past 10+ years could finally win a long-overdue Entertainer Of The Year trophy. And while these industry award shows remain primarily promotional platforms, I think there would be immense value in such statements. So what’s your take on this year’s CMA nominations? Who do you see taking home trophies, and what do you think the main storylines will be at the show this year? Also known as Windmills, I cover country music news and live televised country events, in addition to recapping ABC's 'Nashville.' Additionally, I occasionally do long-form chart analysis that has been cited by Entertainment Weekly, Pitchfork, The Guardian, The New Republic, NPR, and more.